All of our Borneo itineraries are tailor-made for each individual client, according to their requirements and preferences. We do not sell pre-packaged trips of any kind. However, to show you how some of our trips can fit together, and the kind of holidays that previous clients have taken, we have laid out here a few examples. These are for example purposes only and should not be taken restrictively. Your trip can include a combination of any parts of these itineraries - the only limitations are your budget and your timeframe! Experience the very best of Borneo with this superb itinerary which includes a stay close to the Orangutan Rehabilitation Centre. 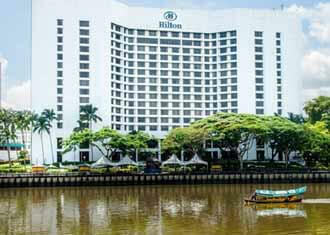 The Hilton Kuching is well located along the banks of the Sarawak River, within easy reach of the sights, bars and restaurants of Kuching. The Batang Ai Longhouse by Hilton is the only comfortable place to stay whilst visiting the national park. The hotel has been design to mimic an Iban Longhouse set within lush tropical gardens and boasting a large outdoor pool, perfect to freshen up after a day exploring inside the park. Sepilok Nature Resort is the best place to stay in and around the Sepilok area, a prime location to visit the Orangutan Rehabilitation Centre. Half way up the Kinabatangan River is the Kinabatangan River Lodge, this rustic property is perfect for your two night stay on this amazing river. The rooms are clean and comfortable with mosquito nets and ceiling fans, the restaurant serves very good Malaysian meals in buffet style. Being the only property within the Danum Valley Conservation area, the award winning Borneo Rainforest Lodge is nestled along the Danum River. With 31 chalets all with an outdoor balcony and ceiling fans (no air-conditioning) the Borneo Rainforest Lodge blends harmoniously with its natural setting. Located on part of a marine park off the coast of Kota Kinabalu, Gaya Island Resort is an amazing luxurious island retreat to recharge those batteries at the end of your holiday. Each villa has a private veranda to watch the wonderful vista of swaying palm trees and the sea lapping the shore close by.